In today's fast-paced world, "A Balanced Design" and "Speed-to-Market" can make the difference between your company being recognized as an "innovator' vs. a "me-too" organization to your customers. Campbell International, Inc. pioneered the Operator Control ModuleTM (O.C.M.) concept, to provide our customers with a one-stop, fully tested cab module that can be introduced directly into the production line. The cab module is bolted on, plugged in, and the machine can be driven off the line, improving throughput and freeing valuable personnel for other critical tasks. This concept can lower cost, improve quality, reduce inventory, speed delivery. 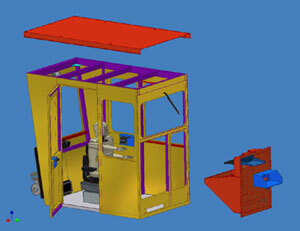 At Campbell International, Inc., we understand your cab requirements may be, or start off, small in number. Whether you need one or hundreds, we have the flexibility and capability of meeting your needs. Let us put our years of Cab Design experience and expertise to work for you.